SaltStack is the software defining the software-defined data center. Essentially, SaltStack is purpose-built to automate the all the hard things in large-scale data center operations. 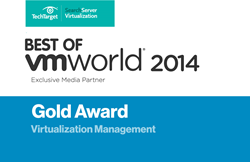 SaltStack, creators of the systems management software stack for server configuration, data center infrastructure automation and cloud orchestration, today announced it won the Best of VMworld 2014 Gold Award in the category of virtualization management. SaltStack software was recognized for its ability to manage all the data center things, regardless of platform or vendor, and to automate tedious IT operations and development tasks. SaltStack is used to deploy and orchestrate cloud infrastructure, optimize configuration of systems and to control vast computing environments from OpenStack and AWS, to Google Compute Engine and Docker, to VMware and Windows and just about everything in between. Not only is SaltStack used to control infrastructure, but it also helps put any software, application stack or code into production faster and more easily. An independent team of judges consisting of experts and editors from SearchServerVirtualization.com reviewed more than 200 submissions to evaluate products according to innovation, value, performance, reliability, and ease of use. The Best of VMworld 2014 Awards “Virtualization Management“ category is open to products that monitor, track and troubleshoot VM availability and performance problems, migrate files, manage VM lifecycles, configure and provision VMs, or provide other VM management functions. Regarding the SaltStack win, SearchServerVirtualization.com judges said, "While some of its competition is developer-focused, SaltStack really listens to operations." SaltStack is a complete systems management software platform for fast and scalable automation of any cloud, application stack or data center infrastructure. Specifically, SaltStack is used by system administrators and developers to automate configuration management, private cloud building, public cloud orchestration and autonomic infrastructure. The Salt open source project was launched in February of 2011 and is now one of the fastest-growing, most-active communities in the world. SaltStack was founded in August 2012 to support the Salt project and to deliver SaltStack Enterprise packaged for the world's most-dynamic large and small businesses, web-scale applications and clouds. SaltStack won an InfoWorld 2014 Technology of the Year Award, won the 2013 GigaOm Structure LaunchPad competition, was named a Linux Journal Reader's Choice product in five categories including "Linux Product of the Year" and "Best New Commercial Application," was named a Gartner 2013 Cool Vendor in DevOps, won the Best of VMworld Gold Award for virtualization management, and was included on the GitHub Octoverse list for 2012 and 2013 as one of the largest, most-active open source projects in the world. For more information, please visit SaltStack.com.